As one of the world's biggest brands, HP's laptop range is comprehensive. Its consumer Pavilion line comprises high-quality home laptops at a variety of prices, with the Pavilion dv7-3020ea being the most powerful product to date. The quad-core Core i7 processor runs multiple applications flawlessly, ensuring you can work as fast as you require, without any worry of the laptop letting you down. Graphics are slightly less capable and bettered by many other Core i7 machines. The dedicated Nvidia GPU does provide ample power for demanding gaming and multimedia use, so this is still a powerful media centre, but the Acer and Toshiba are significantly more powerful. 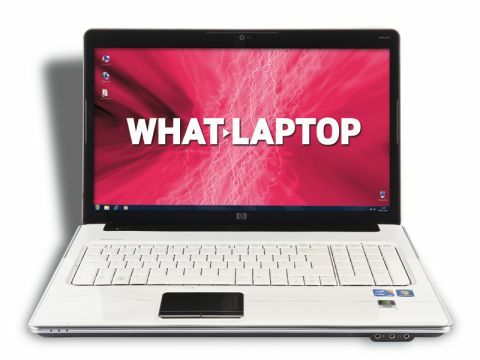 Where the HP stands out is the quality of its 17.3-inch screen. Though it's lacking a Full HD resolution, it's ideal for viewing movies and photos. Images are stunning – proving sharp, bright and vibrant – and are perfect for watching Blu-ray movies. While the optical drive cannot write data to Blu-ray discs – unlike the Toshiba Qosmio – you can watch the latest HD movie releases in stunning clarity. As with all the machines in this group test, an HDMI port is in place for connecting to an HDTV for the largest possible picture. At 3.8kg, this is not a machine you'll want to carry far. Despite its powerful performance, battery life impresses, running for 228 minutes during standard office use. However, this drops to 129 minutes when watching a DVD. The chassis delivers HP's usual high standard of quality, with a strong build throughout. The white plastics inevitably attract dirt, but with its resilient panels, tough plastics and sturdy framework, this is a laptop that is sure to last you for years. The same level of quality extends to the user interface. The large keyboard includes a full numeric keypad for easy data entry, and all keys are fixed firmly in place. When typing at speed, the board is quiet and responsive, making it a pleasure to use. Rounding out the package is the HP's stunning storage. Two 320GB hard drives run side by side for 640GB of storage – 140GB more than all other laptops in this group test. As a result, you'll never need to worry about running out of storage space. Despite lower graphics performance than its rivals, the quad-core power and great usability of the Pavilion dv7-3020ea make it a compelling choice. Add to this its vibrant screen, ample storage and incredibly reasonable price, and you've got a great choice for a media centre.